This might be the hardest article I’ve ever written. The most divisive player on the Port books is ever the subject of feverish debate in the Sandpit and online, so much so that the man himself celebrated one of his goals last season by sitting down and typing on the turf, a show of defiance to his keyboard warrior critics. Now, it’s only fair for me to acknowledge that I have, on numerous occasions, been one of those critics. I think almost everyone has been at some point. When you’ve watched the Midfield Monk as much as any regular viewer of Port has, you just have to have had moments of frustration, rage even, at Pakorn when he’s at his worst. So, before I come to his defense, let’s first briefly hear the critics’ case. He’s lazy. Unfortunately, we are not blessed with GPS data in Thai football, but if we were it would likely prove that he covers less ground than any other Port outfield player. He’s slow. Most wingers have a bit of pace. Pakorn doesn’t. He’s predictable. He’s very good at a few things, but when he does them on repeat, it becomes easy for the opposition to predict what’s coming. His stats are skewed. They’re only so good because he hogs the ball and takes the majority of dead balls in the final third. He’s soft. Our goalkeepers aim kicks at Pakorn with absurd regularity, considering that he seldom challenges for, let alone wins, the ball. He doesn’t do 50/50 tackles either. He’s inconsistent. Even Pakorn’s fiercest critics won’t deny his talent, but they will berate him for not showing what he’s capable of week in week out. When he’s bad, he’s bad. His highest level is unplayable. His lowest is unfathomably poor for someone of his ability. He’s untouchable. At times Pakorn seems to be undroppable, not because of his performances but because forces on high seem determined to keep him in the team come rain or shine. He’s not in demand. Other than Police Tero on two occasions, I can’t think of another team who has expressed a serious interest in signing Pakorn. He’s selfish. He shoots from corners. And freekicks. A lot. This undermines his teammates, who are often reduced to being bystanders while Pakorn single handedly goes for glory. He’s lazy. Not any more. Maybe. Hopefully. Yes, we’ve seen Pakorn turn up for pre-season looking like he’s bankrupted half of Bangkok’s buffets in his month off, but that is not the case this year. After being called up by the national team for the Suzuki Cup, Pakorn has had an extra month’s hard training and so far in pre-season has looked like Port’s sharpest player. I’m not saying he’s our fittest or hardest working player all of a sudden, but he’s certainly pulling his reduced weight. I’m quietly hopeful that this is going to make a real difference to his performance level this season. He’s slow. So? With the ability to make a yard for himself and whip the ball in with either foot, that’s basically irrelevant. Some players need pace to be effective, Pakorn demonstrably doesn’t. He’s predictable. Predictably effective. I’m not sure that Thai goalkeepers would agree that he’s predictable. Pakorn’s propensity to shoot when most would cross must keep goalkeepers on their toes a bit. They certainly can’t be charging cavalierly off their lines to punch or catch many of his deliveries for fear of the ball flying over their heads and into the top corner. We’ve all seen him do it before. Also, is it fair to criticize Port’s top assister for shooting too often? How many assists does he have to get year in year out to be considered a team player? Will it ever be enough? Port’s other wingers do go for glory less often, but they also provide less chances for their teammates. It doesn’t seem to add up; it’s not magic, just Pakorn. His stats are skewed. He’s a dead ball specialist. In the last two seasons he’s scored 13 and assisted 32. Only Suarez can boast better numbers, and his combined total is only 5 ahead, despite playing in a more advanced position. You can try to put an asterisk by those numbers all you want, but you’re fighting a losing battle. Penalty takers take penalties, dead ball specialists take dead balls. Does Kane’s Golden boot at the World Cup have an asterisk next to it? He did his job, taking the responsibility of converting from the spot, and Pakorn frequently shoulders the burden of taking the majority of Port’s set-pieces, and doing so pretty bloody well. Most of the time. Other teams have dead ball specialists too, and most of them don’t manage to churn out the volume of goals and assists that Pakorn does. He’s soft. Fair enough. I can’t pretend this hasn’t annoyed me at times, but I would also be annoyed if he got himself injured and we were stuck with a vastly less productive player on the right wing. Players who get kicked can either take the punishment and most likely pick up a few knocks, or stay well away and avoid injury to the best of their ability. You can put this one down as a less than forceful defense. I would like to see him challenge for the ball more often, although I think I understand why he doesn’t. He’s inconsistent. And which of our attackers isn’t? We’ve leveled the same criticisms at every creative player at Port at some point. The fact that he has so much natural ability makes it more frustrating in his case, but that doesn’t mean that Pakorn should be singled out for more grief than other players who have just as many off days. It’s seen as a positive when a striker can play poorly and still score. Should the same not apply to Pakorn when he underperforms but then provides a moment of quality that leads to a goal? When he’s bad, he’s bad. And which of our attackers isn’t? Again, I think this can apply to Port’s other attackers just as much as it can apply to Pakorn. He’s untouchable. He doesn’t pick the team. I can only remember Pakorn being dropped on a couple of occasions under Jadet. He was left out of the XI when Port traveled to Honda in 2017, only to be brought on with Port 5-0 down. He scored a free kick. Typical. I can’t remember the other occasion(s) in any detail, but I remember him coming back with renewed purpose and showing us what we’d been missing without him being in the side. What I’m trying to say here is that dropping Pakorn every now and then is not a bad idea, and I don’t see calling for him to be left out occasionally as a criticism. A rested, motivated Pakorn is what he all want to see, and if dropping or resting him is the best way to achieve that, than that’s what Jadet should do. Pakorn’s not picking the team anyway, so there’s not a lot he can do about it. He’s not in demand. Thankfully! The Sandpit has had occasion to bring up the Pakorn issue with a few T1 bosses, and none of them expressed an interest in trying to sign him. Police did try and fail a couple of times, but otherwise there is surprisingly little speculation surrounding the future of a player who puts up such impressive numbers every season, while other Thai wingers summarily fail to match his output. Even the national team staunchly refused to give him a go until the Suzuki Cup last year. Their lack of interest in Pakorn surely doesn’t stem from doubt of his ability but rather his attitude. Again, I can’t put in a particularly staunch defense here, as I have quite reasonably questioned his attitude on numerous occasions, but I do think that the criticism is sometimes a little exaggerated. He’s never said anything derisory about Port or our fans, and as far as I know he’s never refused to train or play, aside from maybe asking to be subbed off a couple of times in minor games. He’s hardly Nile Ranger, is he? Last season he did make a stupid error, agreeing to play an exhibition game in the middle of a packed schedule, resulting in him fainting and being rushed to hospital. A silly thing to do no doubt, but to my mind the likes of Wuttichai, Wagner, Kaludjerovic, Thiago and even Suarez have all demonstrated having a more disrespectful attitude than Pakorn. He’s selfish. Yes, but… This is the hardest of all for me to make a decent defense of, although I’ll get by with a little help from some perhaps unlikely allies. Does he genuinely believe the team is better off with him shooting from way outside the box rather than helping build an attack? There’s no way to know, but the alternative is that he simply wants the glory for himself, and I don’t think that’s true. The former is clearly far less grievous than the latter, and I’m going to run with that idea for a moment. If you think he’s just a glory hunter I doubt I’ll be able to change your mind, but if, like me, you have a little more faith in the Midfield Monk, read on. A particularly avid Pakorn fan would praise him for taking responsibility, rather than being selfish, and trying to make something happen while others show less willingness to risk the ire of the fans if it goes wrong. This is where things get interesting. It’s an argument made not by me or another random fan, but by his teammates. Whilst opposition coaches may not talk about Pakorn in particularly glowing terms, Port players have not had any time for criticism directed at the Midfield Monk, even off the record. He provides an outlet, they say. He takes the heat off the defence with his forward runs and passes. There’s a lot of pressure on him to provide, and he does an admirable job. Of course you don’t have to agree with these players, but it’s certainly interesting that they defend him so vociferously. I must admit to having had my own sneaking suspicions that they may well privately be the ones most frustrated by him. Not so. If the likes of Josimar and Boskovic are to be believed, the way Pakorn plays makes life easier for the rest of the team, who see him as an indispensable cog in the Port machine. Far from being a divisive figure, his presence is appreciated by his teammates, who see just how talented he is every day in training as well as on match days, and appreciate having a teammate who is always willing to put his best foot forward when the time comes, unless what’s in front of him is a tackle, obviously. I realize there’s every chance I won’t be changing many minds here in any meaningful way. I’m not sure I’ve even fully convinced myself of some of my arguments, and I expect to encounter the inner struggle brought on by Pakorn fatigue again very soon. What I hope I do achieve is to give those on the fence about the Midfield Monk something to cling on to, and a way to defend him when he’s being mercilessly slagged off on the terraces. Does he deserve it sometimes? Absolutely, but he’s our player and as such I’m going to defend him against all enemies, foreign and domestic. The best right foot in Thailand has my unconditional support this season as he prepares to finally fulfill his potential, and I’ll be damned if I go in to the season where he becomes the best domestic player in the league with a negative frame of mind! I am, perhaps against by best instincts, thankful that we don’t have some other winger who works harder but produces less. This is your year, Pakorn. Now get out there and show ’em! After watching Port crowned 2018 Futsal champions at the Thai-Japanese Stadium, we piled into a taxi and headed down to the PAT for the second friendly of the pre-season. It was good to see Port team win a trophy but there’s no substitute for real football and we were rewarded with a highly entertaining game. Port began the game with pretty much a first-team XI, missing only Thailand internationals Kevin, Nurul and Sumanya, and more worryingly Boskovic, who was conspicuous by his absence. Dolah started alongside Rochela which suggests he is finally first choice in Jadet’s thinking. Ratchaburi opened the scoring on 5 minutes when their very impressive new signing, ex-Auxerre, Nimes & NEC winger Steeven Langil teed up a perfect cross for Kang Soo-Il who headed past Rattanai. Langil looks the real deal and could be one of the signings of the season. 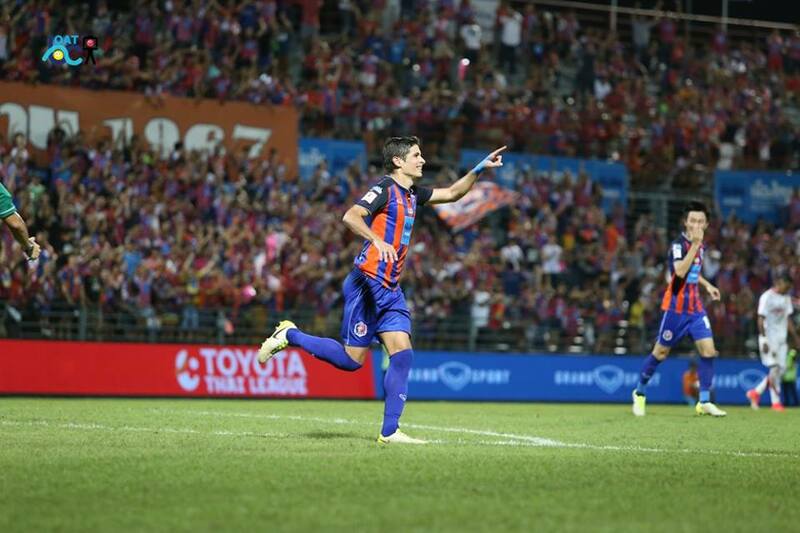 Port equalised a minute later when Rochela converted a penalty after Suarez had been upended by Ratchaburi’s keeper. The Spanish midfielder was as fired up as ever and showed that the word “friendly” isn’t in is vocabulary as, even after being awarded a penalty, he continued to get in the keeper’s face, followed by that of the referee. Don’t ever change Sergio. With the Sandpit crew sitting close to the pitch we were able to, ahem, enter into dialogue with a few players, and whilst Ratchaburi striker Kang Soo-Il got some inevitable taunts about his use of moustache cream, the focus was on Port’s portly winger Pakorn. Dom gave him a bit of bantz about his selfishness and lack of teamwork; Pakorn made a “yeah yeah, keep talking” gesture, went down the other end, and set up a tap-in for a newly-shorn Bodin. Dom took this as evidence of his motivational skills, but really Dom, until Pakorn picks you out of the crowd, comes over to shake your hand and thanks you for inspiring him with your abuse, you’re an amateur. The second “third” of the game kicked off with almost identical lineups and Bodin soon made it 3-1 with an absolute screamer. The removal of his trademark afro seems to have given the lacklustre winger a new lease of life as he looked well up for it yesterday. Ratchaburi got a goal back soon after this if memory serves me correctly but I can’t remember anything about it. The third third featured a reserve side, which unfortunately featured Yossawat, who must’ve run over Jadet’s dog or something as he is about as far away from the first XI as I am at the moment. The stiffs gave a good account of themselves and in the 82nd minute the Port Pele himself, Arthit, bundled in a bustling header to extend Port’s lead. An impressive win then, and Port’s key men all look well up for the season ahead. With Nurul, Kevin, Boskovic (hopefully), Sumanya and our new mystery midfielder all to come into the side, the signs for 2019 are very positive indeed. Anon bossed the midfield like a seasoned pro; Dolah led by example, yelling at his teammates throughout; and Bodin capped a superb performance with two goals; but the MOTM was indisputably (apart from Dom) Pakorn. The Midfield Monk could’ve taken the day off like his fellow AFF participants, but he chose to show up and put in a very impressive shift, even chasing a long ball at one point. New season, new Pakorn? Let’s hope so. Several Thai websites are reporting that Port right-winger & assist freak Pakorn could be heading back to former club Police Tero on a season-long loan. With the club having signed Thailand international right-winger Nurul, Pakorn could be faced with a choice of either playing out of position on the left or sitting on the bench, and it appears that the Midfield Monk doesn’t find either option particularly attractive. Pakorn had a superb 2017 season with 6 goals and an amazing18 assists, and was on particularly good form after his somewhat bizarre mid-season spell at the monastery, working much harder for the team and playing much more unselfishly. There are few better crossers or dead-ball strikers in Thai football, and so it would be a shame to lose him. That said, Port clearly haven’t spunked 20mTHB on Nurul (the only T1 player with more assists in 2017) to play him out of position, so it would be no surprise to see ‘Korn try his luck elsewhere. Of course, if Pakorn does leave, it means Port will be in need of a left-winger, with ASEAN winger Terens ‘Flash’ Puhiri not likely to get much game time due to foreign player restrictions. Watch this space for more news as we get it! https://i2.wp.com/www.portfcsandpit.com/wp-content/uploads/2017/07/pakorn.jpg?fit=635%2C321321635Tim Russellhttp://www.portfcsandpit.com/wp-content/uploads/2018/11/sandpit-logo-nov-2018-Copy.pngTim Russell2018-01-18 09:58:572018-01-18 09:58:57'Korn: Freak on a Lease? Transfer season is well and truly upon us, and unsurprisingly rumours are aplenty. The latest gossip has had Port signing a 12-goal midfielder, whilst teetering on the brink of losing a star player. But don’t panic everyone… Tana’s probably staying! We start with the exciting news that Bajram Nebihi is being strongly linked with a move to PAT Stadium. The big Ubon attacking midfielder was integral in his team’s electric start to the season, scoring 5 times in his first 4 games, and he ended the season with 12 goals and 2 assists in the league, despite falling a little out of favour and completing 90 minutes just 4 times in the second half of the season. Yes, the man who has been dominating the rumour mill over the last few days is our very own Pakorn Prempak. Fresh from coming third in The Sandpit’s player of the year poll – making him Port’s best performing Thai player of 2017 – Pakorn had been repeatedly linked with a move back to his old club Police Tero. Quite why Pakorn would want to make a backwards move to a club who finished below Port in the league was beyond me, but the most recent stories thankfully seem to suggest that Pakorn had been using the interest of his former club to coax a better contract offer out of Port. 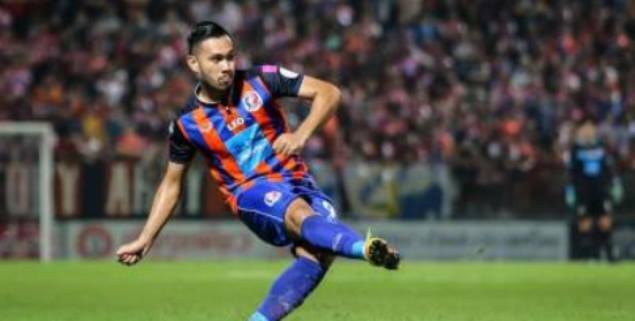 SMM Sport reported that Jadet also weighed in yesterday, reminding Police that the Midfield Monk still has a year remaining on his contract and would not be going anywhere just yet. If Pakorn has indeed been using his former club as leverage to get a pay-rise then we can’t say we blame him. Pakorn, nicknamed Bas, has become Port’s most important Thai player in 2017, and his contract should probably reflect that. With Jadet having stood by his man and made his position clear, the club have now had to show that they are serious about backing him, and keeping Port’s star players. News has just now emerged that Pakorn has got what he wanted and joined El Capitan in signing a brand spanking new contract, so the Port fan groups’ #savebas hashtag can now be put to rest! https://i2.wp.com/www.portfcsandpit.com/wp-content/uploads/2017/11/nebihi-running.jpg?fit=1314%2C7597591314Tom Earlshttp://www.portfcsandpit.com/wp-content/uploads/2018/11/sandpit-logo-nov-2018-Copy.pngTom Earls2017-11-25 12:14:422017-11-25 12:19:12Tom's Transfer Talk: Nebihi, or not Nebihi? The Sandpit’s Port FC Player of the Year 2017 is….David Rochela! Last week we once again opened the polls for the Player of the Year competition, and voting was very lively with over 600 Port fans clicking on their favourite player. The last couple of days’ voting saw some rather suspicious voting patterns, with 36% of our site traffic coming from SPAIN, which possibly explains why it turned into a two-horse race between Port’s two Spaniards, with the rest of the candidates trailing in their wake. For the second year in a row, Port’s popular Spanish captain wins the award, though not with the landslide we saw in 2016. David has had another solid season at the PAT, leading by example, playing the game with honesty and respect, and even banging in 7 goals. The naysayers may point to Port’s poor defensive record this season, but it has to be said that without David, our Goals Against column would undoubtedly look even worse. As yet, we have no word as to whether the captain will lead Port in 2018 but our gut feeling says he will. Congratulations David, and hope you’re around to go for the hat-trick in November 2018! You’d have got pretty long odds on this back in June, when many Port fans – myself included – were calling for Maranhao to take Suarez’ foreign player slot at Port, after the Spaniard had an inconsistent first half of the season. But in the second leg, Sergio was a different player and, had the vote been based solely on the last 5 months, he’d almost certainly have won outright. He’s been a lot more focused, given the proverbial 110% in every game, and weighed in with 14 goals – almost unheard of for a Port midfielder. As with Rochela, we don’t know if he’ll still be around next season but given his late-season form, we suspect he might. Thanks to the Spanish mafia monopolising the vote, the rest of the candidates are a loooooong way back, with the chasing pack led deservedly by the Midfield Monk himself, Pakorn. This was the season in which the Port winger finally realised his potential and added workrate and discipline to his undoubted talent to become Port’s most productive player with 6 goals and a staggering 18 assists. Sadly we are hearing very strong rumours that he may be returning to his old club Police Tero for next season, which would be bad news for Port and surely a backward step for a player who should be looking to get a national team place before long. Thanks, or should I say gracias, to all who voted, congratulations again to David, and watch out for more Sandpit fan polls coming soon! https://i0.wp.com/www.portfcsandpit.com/wp-content/uploads/2017/01/rochela-header.jpg?fit=737%2C325325737Tim Russellhttp://www.portfcsandpit.com/wp-content/uploads/2018/11/sandpit-logo-nov-2018-Copy.pngTim Russell2017-11-22 17:17:342017-11-22 17:17:34The Sandpit's Port FC Player of the Year 2017 is....David Rochela! As expected, Port dispatched T3 high-flyers Ayutthaya Utd at the PAT last night to take their place in the last 16 of the Chang FA Cup, with a dynamic attacking performance which, had the finishing been more clinical, could and should have produced a hatful of goals. August 2nd is my dad’s birthday and were he still with us, he would’ve been 77 yesterday. So what better way to celebrate the birthday of the man responsible for so many of my formative footballing – and drinking – experiences by having a few beers and watching Port? It might’ve lacked the glamour and significance of our most memorable game together – Coventry v Spurs in the 1987 FA Cup Final – but as a man who played and refereed Coventry Sunday league football for over 30 years, I’m sure he’d have appreciated the earthiness of the surroundings, and the coldness of the Leo. I know I did. Anyway onto the football. Zico once again showed that he’s up for the cups by picking a full-strength team, the only change from Sunday’s lineup v Chiang Rai being the return of Adisorn (13) for Ittipol (7). Ayutthaya, on the other hand, seem to be more focused on their T3 promotion battle so whilst star player Noah Chivuta started – and put in a performance that showed he truly belongs at the top level – last weeks MOTMs Jirawat and Kendall were rested. The sight of Ayutthaya’s team sheet led to excited predictions of 4-0 and 5-0 amongst the farang faithful, and in the first half Port did their best to make those dreams reality. Because for the first 45 minutes, Port absolutely battered their opponents, with Suarez (5) and Siwakorn (16) bossing the midfield, Genki (18) charging down the left with his socks down a la Peter Barnes, and Pakorn (9) & Nitipong (34) rampaging down the right. Chance after chance was created, with pretty much every outfield player having a shot at some point without a single one hitting the target. Josi (30) in particular was having a right mare, missing an open goal midway through the first half and generally still looking out of sorts since his return from injury. Ayutthaya did have a few chances, normally due to Panpanpong (19) once again not bothering to do his defensive duties and leaving acres of space down Port’s left. When will Zico realise that he simply isn’t good enough to play as a wing-back and replace him with Yossawat? With Chivuta pulling the strings in midfield and lively Brazilian forward Maraba keeping Port’s defenders on their toes, they frequently threatened an opening goal which, given Port’s wastefulness, could’ve been fatal to the home side. Thankfully, 13 minutes into the second half Port got the goal their sparkling attacking play deserved. Nitipong fed Pakorn with a somewhat overhit pass down the right – a pass which, pre-monastery, the no9 might well have given up on. But the Midfield Monk is a player reborn and he kept the ball in, steamed down the right, and pinged in an inch-perfect cross right onto the head of Josi, who showed he can head the ball after all and buried it into the Ayutthaya onion bag for 1-0. But any thoughts that this might open the floodgates were somewhat misplaced, as Port, seemingly torn as to whether to park the bus or go for a second, found themselves on the back foot for much of the last 20 minutes, with Worawut making a couple of smart saves and Ayutthaya grazing the crossbar on a couple of occasions. On 90 minutes however, Ayutthaya, as they did last week, found themselves down to 10 men when one of their midfielders put the boot in on Prawinwat long after the ball had gone and was given his marching orders. A couple of minutes later, in the last meaningful action of the game, that man Pakorn skipped past two defenders and once again found Josi in the box, and the Brazilian had time to round the keeper and a defender before sticking it in the net for 2-0. So, as with the Chiang Rai game on Sunday, Port looked very lively and played some wonderful attacking football, only to be let down by poor finishing. 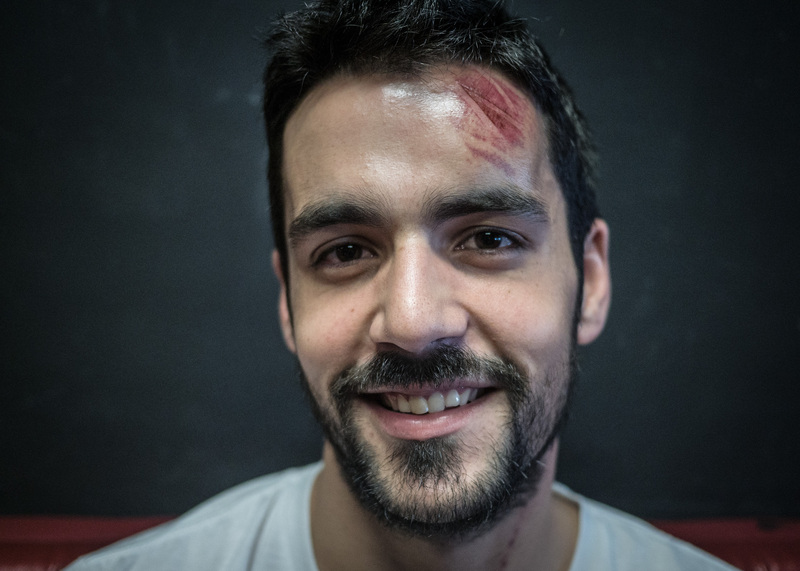 You can get away with that against T3 teams, but we’ll need to take any chances we get against Glass on Saturday. Still, we’re now into the last 16 of the FA Cup and have as good a chance as anyone of going further. With the team looking faster, fitter and more motivated under Zico, Josi finding his scoring boots again, and players like Pakorn and Suarez finally finding some consistency, the rest of the season should be a lot of fun to watch. There were a few contenders for the coveted Sandpit MOTM award last night. Suarez managed his third impressive performance in a row – a record for him; Genki put in one of those balls-out left wing shifts that made us all love him in the first place; Nitipong complemented Pakorn beautifully down the right; and Adisorn was the usual Tasmanian Devil-esque whirlwind of energy and tackling in midfield. But once again, and for the third game in a row, the award goes to Pakorn. Whether it’s the influence of Zico or some higher power, the right-winger is finally fulfilling his potential and becoming the star player he’s always hinted he could be. Once again he provided both assists, and at one point he even got straight up after being tackled and carried on running, and you’d have got pretty long odds on that earlier in the season. The big question is – can he do it at Bangkok Glass on Saturday? He’ll need to if Port are to stand any chance of getting something out of the game. Port got their 2017 League Cup campaign off to a winning start at T3 Ayutthaya but made hard work of it, winning 2-1 after being taken to extra time. Running Thailand’s finest English language football website isn’t all cocktail parties, adoring groupies and VIP boxes, and your correspondent had to cancel his trip to Ayutthaya at the very last minute after his big toenail got infected & had to be somewhat painfully removed on the morning of the game, so this brief report is based on watching the match on a dodgy (is there any other kind?) internet stream. As is so often the case in away games, despite Zico signalling his intent to have a real go in the cups Port started rather limply and it was Ayutthaya who made the early running – having knocked Chonburi out of the FA Cup they clearly fancied their chances of taking another T1 scalp. On 16 minutes a giant-killing became even more likely when a cross from the right found big striker Kendall on the edge of the box, who steered his header past a somewhat static Worawut (36) into the top corner. The shock of going a goal down sparked Port into life but as usual passes were going astray in the final third, with Kalu (10) putting in another lacklustre performance which had many of us watching pining for Maranhao. Nevertheless, the Serb is lethal in front of goal and had a header acrobatically turned round the post by Ayutthaya’s excellent keeper who made a number of superb saves – just before that he managed to fingertip a deflected Siwakorn (16) shot away from goal. Just before HT, a thunderous Pakorn (9) free kick cannoned off the post. The Midfield Monk didn’t have one of his better games with numerous crosses, free kicks and corners flying over the bar, but he was still at the heart of most of the good things Port did. In the second half Port laid siege to the Ayutthaya goal only to be continually denied by that goalkeeper and some desperate goalline defending. Kalu was replaced by the Moustachioed Assassin Tana (99) with predictable results (ie an utter lack thereof), whilst Suarez (5) came on for Genki (18), somewhat more successfully, and it was the rangy Spaniard’s presence that led to Port’s equaliser, after a Pakorn free-kick was saved and Ayutthaya’s defenders got in a bit of a flap trying to clear it. I don’t think Suarez got the last touch as the ball flopped over the line – it was an OG in my opinion – but any 92nd minute equaliser is a thing of beauty, and it took Port into extra time. And there was another bonus in store when, after a tangle with Siwakorn, Ayutthaya forward Noel Chivuta complained to the referee that he’d been elbowed and was bafflingly given a red card. The break saw some entertaining shenanigans with Ayutthaya’s coach and Port’s goalkeeping coach both having an attack of the Cunhas and walking around pointing at people, before play resumed, at which point it was clear that Ayutthaya were knackered and the game was Port’s for the taking. Pakorn came closest in the first half with an absolute thunderbastard of a shot against the crossbar, though Ayutthaya almost caught Port on the break a couple of times. Just when it looked as if the second half was going to be equally goalless and penalties loomed, Pakorn skinned the home left-back and chipped in a lovely cross right onto the head of Suarez, who buried it into the net. 2-1 to Port, and into R2 after a bit of a scare. Whilst this wasn’t Port’s best performance of the season, they just about did the job against a lively Ayutthaya team who deserve a lot of praise for their performance. It’s good to see Zico taking the cups seriously and fielding a full-strength team (if any team with Tana in it can be described as full-strength), and Port should dispatch the same opposition in the FA Cup next week with hopefully a bit less huffing & puffing. The mercurial no9 was at his most frustrating last night. On the one hand he continually misplaced passes, crosses & corners; on the other, he hit the bar twice and notched up assists for both goals, and it’s that that wins him the coveted MOTM award, on a night when it has to be said there weren’t too many contenders. Today I am going to talk as much about the away day experience as I am the game. By the way for any of you that missed it, we lost. The day started with me having to get up at 04:00 to put a bit of a shift in at DKSH towers to enable me to bonk off early for an “offsite meeting” yeah that old chestnut, the perks of being the boss. Remember always, family, football and work in that order. As I sat in the departure lounge at Don Mueang I noticed a few familiar Port faces – Achim my German buddy and Big Bubba, who were to become my trusted lieutenants. I also noticed a small chick in Adidas trackie bottoms with an entourage – it was our owner Madam Pang, who greeted me on the way on the plane with a huge smile, having spotted I was in her team’s colours. On arrival at Buriram Airport, my tenth time there, we were informed that the club had hired a car and Madame insisted we get in. We were staying at The Amari, and if you ever get a chance put this on your bucket list, it is one of the best hotels I have ever stayed in and I’ve been to a few. Its simplicity merged with a real hospitable friendliness made the defeat a lot easier. Off to Paddy’s for some beers and a throw of arrows and then back to the game. We shook hands with every single Port fan before the game: we had about ninety in total. Both teams adopted the exact same formation, our now familiar 4-4-1-1. Kalu (10) was always going to have a tough task in that lone striker role against the league leaders complimented by Suarez in the hole, they did OK to be fair. Buriram on the other hand had a samba double operating these roles and again they did OK.
First twenty minutes they came at us strong, our midfield battled hard. Ittipol (7) and Siwakorn (16) knew straight away they were in for a tough time and they weren’t helped by the Thunder Castle full backs who had the pace of thoroughbreds. In the 27th minute one of the aforementioned Brazilians broke the deadlock in unbelievable circumstances. Well unbelievable to anyone who hasn’t watched Thai football before anyway. A kick out from Rattanai (17), who has now established himself as our number one stopper in my opinion, fell straight to the Buriram center midfielder who hooked a right footer over the top to Coelho who was two yards offside and to our disbelief ten seconds later the ball was in the onion bag, Rattanai on his arse!!! 1-0 Buriram. That said if you watch the goal our defensive positioning would not be out of play at the red arrows display at Duxford air museum. How the hell Rochela was ten yards from his partner Dolah and the two fullbacks I’ll never know. Think back to the Invincibles – you would never see Tony Adams two yards from the high line never mind ten. The second half Zico, my friend, you earned your corn. We were fantastic in every department and my team put in a display worthy of my trip and the expense and as a football fan if you come away from a midweek away came having ticked those boxes then you have done well. We had a couple of half chances, Pakorn (9) started pulling the strings and was assisted ably by Nitipong (34) down the right. Listen to me here, when these two bring their A-game there is no better right hand side in the league. Defensively we were solid although we rode our luck at times but we were playing against the league leaders. Adisorn (13) and Tana (99) entered the fray and performed admirably and Genki, though substituted, put in his usual shift. In the 81st minute Pakorn fizzed in a free kick that took paint off the crossbar but it wasn’t to be but we yet again proved one point, on our day Thai Port are a match for anyone. Onto Ubon where I am that convinced of a victory I will be discussing as serious investment with my compatriot Paddy Power. Peace out my fellow sandpit members, boarding has been called! As with Sunday’s win over Honda, Port put in a much improved performance with a greater degree of intensity, better organisation and crisper passing than seen during the last days of Jadet, and as such there were several contenders for the coveted Sandpit MOTM award. Rattanai, who loves playing against Buriram, bossed his area and made some superb saves when needed; Nitipong for once managed to combine both attacking and defensive duties; and the midfield duo of Siwakorn and Ittipol didn’t give Buriram a moment’s peace. But my MOTM this week is the Midfield Monk himself, Pakorn, who has come back from the Wat with a new lease of life. His corners and free kicks could, if there had been anyone on the end of them, given Port the win, and when he moved into a more central role – as our own Tommie Duncan has long advocated – he looked even more of a threat. If he can keep up this level of performance in the next few weeks, Port will be hard to beat.